I admit to being in a small dedicated minority of cup watching enthusiasts. Granted we’re not as well known as our bird watching counterparts. None the less we’re just as committed to our hobby. That leads me to the photo above. 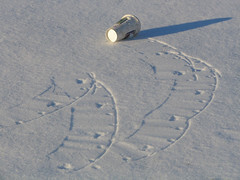 While out for a walk I was startled to find the trail of this 20oz white lidded unidentified cup. Now, I’ve seen a wide assortment of cup varieties in this area. For instance the red lidded 64oz Speedway, the 16oz white lidded Hungry Howie and the 44oz clear lidded Qdoba. But, this one had me stumped. So I got out my cup identification book to see if I could identify the cup by its trail. After a good deal of looking I matched the trail to the Starbucks variety. This was odd since the nearest Starbuck’s habitat is nearly 30 miles away. This cup was clearly out of it’s migration territory. Unfortunately all cup varieties have an average life span of about 2 hours. That’s usually if a person “babies” their cup consumption. However, we all know people who can down a 64oz cup in 15 minutes. That to me is irresponsible cup ownership. Anyway, I figure this cup got blown off course. I speculate it may have been rejected by it’s dispenser. Lacking the survival skills other 20oz cups have I’d say it drifted aimlessly for quite some time. Because this was so rare a find in my area I decided to take it home and perform an autopsy on it. I wanted to know how strong it was before it’s untimely demise. So I added some ice cubes and a bit of 7-UP. (other carbonated sodas like Mountain Dew are just too strong for the test. It skews the results. Ref. Dec. 1993 Cuppers Newsletter.) This cup clearly couldn’t hold it’s ice and a beverage simultaneously. This was obvious when I very lightly squeezed the cup sides and the lid and straw popped off. It probably died a quick death due to a collapsed cup lining. As to how it got to my area, it’s probable the wind caressed its little cup carcass and swept it from the Starbucks parking to it’s final resting place. No reason to feel sad though. There are plenty of Starbucks species left all over the planet. It worked out well for me since I could add that variety to my cupper’s life list. If anyone is interested in joining this growing hobby or are interested in back issues of our “CUPPERS” newsletter, email me. ...will there be center-folds of cups? Sorry, the newsletters are only one page. No center and no folds.